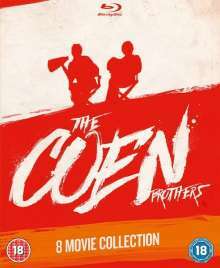 Der Artikel The Coen Brothers 8 Movie Collection (Blu-ray) (UK Import) wurde in den Warenkorb gelegt. 'The Big Lebowski' (1998) follows Jeff 'the Dude' Lebowski (Jeff Bridges), a laid-back bowling buff who gets mixed up in a blackmail plot involving a millionaire namesake. Roped into delivering the ransom to secure the release of the millionaire's kidnapped wife, the Dude's karmic balance is really put in a spin when his gun-toting buddy Walter (John Goodman) decides to help out. In 'O Brother, Where Art Thou?' (2000) three clueless convicts escape a chain gang and go in search of buried treasure. This leads to a series of unlikely adventures - involving one-eyed con men, seductive sirens and Ku Klux Klan lynchings - which culminate with the boys inadvertently discovering fame as hit recording artists The Soggy Bottom Boys. 'Intolerable Cruelty' (2003) sees George Clooney star as Miles Massey, a divorce lawyer who always wins his cases until he comes head to head with the scheming Marilyn Rexroth (Catherine Zeta-Jones). Miles and Marilyn then each embark on their own ruthless romantic missions to outdo one another and amass great wealth. In 'No Country for Old Men' (2007), while out hunting in the barren wilds of Texas, Llewelyn Moss (Josh Brolin) discovers the aftermath of a drugs deal gone wrong, with dead bodies, heroin and a case filled with $2million in cash. Deciding to take the money, Moss says goodbye to his wife (Kelly Macdonald) and takes off to plan his next move. It's not long before he discovers he's being followed by psychopathic ex-special forces hitman, Chigurh (Javier Bardem), who decides his victim's fate, guilty or not, on the toss of a coin. As Chigurh raises the body count, he in turn is hunted by local Sheriff Ed Bell (Tommy Lee Jones), a hardened cop who could do without the excitement. In 'Burn After Reading' (2008) alcoholic CIA agent Osbourne Cox (John Malkovich)'s wife, Katie (Tilda Swinton), who is having an affair with married federal marshal, Harry Pfarrer (Clooney), is making plans to leave her husband, and is advised by her divorce lawyer to copy his personal files onto a disc. The disc finds its way via a circuitous route to the Hardbodies fitness gym, where two unscrupulous employees, Linda (Frances McDormand) and Chad (Brad Pitt) decide to exploit their find for all they can get. Events soon spiral out of everyone's control in a cascading series of surreal and darkly comic encounters and misunderstandings. In 'A Serious Man' (2009) a Midwestern physics professor's settled and secure life begins to spiral after his wife Judith (Sari Lennick) reveals she is leaving him for his arrogant associate Sy Ableman (Fred Melamed). Larry (Michael Stuhlbarg) struggles to cope with the failure of his marriage and the unlikelihood of his unemployed brother Arthur (Richard Kind) getting a job and moving out of his house. At the same time, his son Danny (Aaron Wolff) is in trouble at school while his daughter is stealing money from his wallet. As Judith and Sy begin to set up home together Larry begins to receive anonymous letters from someone looking to ruin his chances of tenure at the university, while a failing student is trying to both bribe Larry and sue him for slander. In need of help, Larry seeks out the advice of three rabbis. In 'True Grit' (2010), after her father is murdered, 14-year-old Mattie Ross (Hailee Steinfeld) sets out to capture the killer, Tom Chaney (Brolin), with the help of two lawmen - the ageing, alcoholic Rooster Cogburn (Bridges), and Texas Ranger La Boeuf (Matt Damon). Determined to accompany them on their quest, Mattie wonders whether Cogburn, with his loose morals, has the required 'true grit' for the job. When Chaney's trail heads into Indian territory, Mattie, stubborn to the last, insists on joining the pair in their search, which soon finds them in a raft of dangerous adventures that will test them to the core. Finally, 'Hail, Caesar!' (2016) follows a day in the life of fixer Ed Mannix (Brolin) who has to retrieve famous actor Baird Whitlock (Clooney) after he has been kidnapped while filming the next big blockbuster 'Hail, Caesar!'. A group called The Future is holding Whitlock ransom for $100,000, and it's up to Mannix to get him back.